Last month, Comet PanSTARRS delighted Southern Hemisphere observers; steadily brightening and forming a wispy forked tail. Now it’s our turn in the Northern Hemisphere as the icy rock swings around the sun into our evening sky. From the middle to the end of March, PanSTARRS skirts low above the western horizon after sunset. If you’d like to observe this comet, the first step is to find a clear western horizon. You must be able to see the sky meet the ground– no trees, houses, or superstores in your view. Go out shortly after sunset and look toward the west. You will be looking for a wispy object with a short tail. Seeing it could be challenging since it must compete with evening twilight. 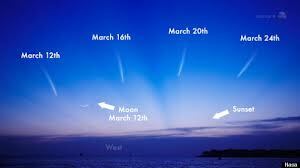 The best time to search for PanSTARRS is on the evening of March 12 and 13. On those evenings, a fingernail-shaped crescent moon hangs low in the west at sunset. The moon can be used as a reference point to help locate the comet. On the eve of March 12, the comet lies about two moon-widths to the upper left of the moon. On March 13, it lies to the moon’s lower right. Although PanSTARRS should be visible to the naked eye, binoculars will yield the best views. On March 12 or 13, begin by locating and focusing on the moon with binoculars. On the 12th, slowly sweep left and slightly upward of the moon, looking for a diffuse object with a short upward-extending tail. Do the same on the 13th, except scan to the lower right of the moon. The comet is visible for about an hour following sunset. Then it too will succumb to the western horizon. For additional help in finding the comet, a quick Internet search leads to pictures, finder charts and other useful information. Once you have located the comet, you can continue to observe it through the rest of the month and into April. Each night the comet drifts slightly to the north in relation to the background stars. It also fades from night to night, as it exits the inner solar system and heads back to the cold black of deep space. 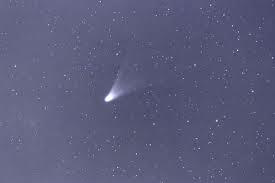 Comet PanSTARRS should be a nice predecessor to the much-anticipated Comet Ison, visible in November and December. Expect more on that one as the time draws closer. Until next time, Happy Stargazing!